The increasing use of mobile phones may have a number of physiological and psychological effects on human health. Many animal and human studies have reported various effects on the central nervous system and cognitive performance from of exposure to electromagnetic fields (EMF) emitted by mobile phones. The aim of the present study was to evaluate the effects of mobile phones on the morphology of the human brain and on cognitive performance using stereological and spectroscopic methods and neurocognitive tests. Sixty healthy female medical school students aged 18–25 years were divided into a low exposure group (30 subjects, <30 min daily use by the head) and high exposure group (30 subjects, >90 min daily use by the head). Magnetic resonance images (MRI) of the brain analysed on OsiriX 3.2.1 workstation. Neuropsychological tests were performed for each subject. In addition, three dominant specific metabolites were analysed, choline at 3.21 ppm, creatine at 3.04 ppm and N-acetyl aspartate at 2.02 ppm. Analysis of the spectroscopic results revealed no significant difference in specific metabolites between the groups (p > 0.05). There was also no significant difference in terms of hippocampal volume between the groups (p > 0.05). In contrast, the results of the stroop and digit span (backward) neurocognitive tests of high exposure group for evaluating attention were significantly poorer from low exposure group (p < 0.05). Based on these results, we conclude that a lack of attention and concentration may occur in subjects who talk on mobile phones for longer times, compared to those who use phones relatively less. Mobile phones, which operate at frequencies of 1.8–2.2 gigahertz (GHz) for digital systems and 400–900 MHz for analogue systems, are currently very widely used, especially among adolescents. Intensive use of mobile phones among adolescents is leading to concern regarding common physical and emotional problems, ranging from insomnia to problems with concentration ,. During mobile phone use, the human brain can be exposed to a high specific absorption rate (SAR) because of its close proximity to sources of radiofrequency electromagnetic fields (RF-EMF) source. Exposure to mobile phones is generally associated with the emitted RF power. Various parameters, including the properties of the absorbing tissue, the antenna position and the magnetic field frequency, must be considered in evaluating the side-effects of RF-EMF exposure on human health ,,. In that context, Hardell et al. suggested that long-term exposure to RF-EMF emitted by mobile phones may increase the risk of brain tumours, such as glioma and neuroma . The morphological and biochemical alterations caused by RF-EMF exposures have been investigated in animal studies. At this point, prenatal exposure results in smaller litter size, lower birth weight and offspring with significant impairment of the hippocampus, pyramidal cell and glial cells ,,. Neuronal damage in the central nervous system has been reported due to both prenatal or early adult exposures to electromagnetic radiation ,. Effects of EMF have also been reported at the cellular level, including alterations in intracellular signalling pathways such as ionic distribution and changes in calcium (Ca+2) ion permeability ,. Several in vivo studies have also reported effects of RF-EMF on behaviour, neurotransmitters and blood–brain barrier permeability ,. In addition to the cellular effects of electromagnetic radiation, the potential carcinogenic effects of EMF emitted by mobile phones has been investigated in various previous studies ,,,,,. The prenatal effects of EMF exposure can include cell death and inhibition of the differentiation of neural stem cells. EMF exposure can also affect neurogenesis in both the developing and adult brain . Bas et al. suggested that EMF exposure can affect the new formation of cells in the cornu ammonis (CA) of the hippocampus during the embryonic development. This may result in deterioration of behavioural and cognitive functions involving learning tasks and short-term memory . Although many in vitro and in vivo experimental studies have been performed, the potential effects of EMF exposure on the central nervous system are still unclear ,. This study was designed to evaluate the effects of EMF emitted by mobile phones on the hippocampus using stereological, neurological and spectroscopic methods that have previously been validated. At this point; we considered two groups with relatively lower and higher reported use of mobile phones. Furthermore; for the better understand of the effects of EMF on the brain tissue, there is a need for further studies at the cellular and molecular level. This cross-sectional study was performed following approval by the Medical Research Ethics Committee of Ondokuz Mayıs University (2014/547). Informed consent was obtained from all subjects prior to the study. In the present study; the medical students were given volunteer forms in accordance with our study criteria. At this point; the related students were recruited from the sixty healthy female medical students (volunteer) who are between 18 and 25 years of age and have been using mobile phones <30 min daily use by the head and >90 min daily use by the head for 5 years. Then; magnetic resonance imaging (MRI) examination of medical students' hippocampus was performed on a 1.5 T scanner (Magnetom Symphony, Siemens, Germany) between September and November 2014, at the Ondokuz Mayıs University hospital. These were divided into two groups depending on the duration of time they reported having talked on their cell phones. Because mobile phone use is ubiquitous, it was not possible to find a unexposed control group. So, the low exposure group consisted of 30 subjects who had spoken on their cell phones for <30 min daily use by the head in the previous five years. The high exposure group consisted of 30 subjects speaking on mobile phones for >90 min daily use by the head in the previous five years. Because people tend to hold phones next to the side of the head that corresponds to their dominant hand, the right-side hippocampus was evaluated on images from right-handed medical students, and the left hippocampus on images from left-handed medical students. MR images were taken using a 1.5 T MR unit (Magnetom Symphony, Siemens, Germany) with a six-channel coil. Data were analysed from T1-weighted sequences (T1-fl3d-cor-iso) with the parameters Repetition Time/Echo Time (TR/TE): 13.0/4.76 ms; FOV read: 200; FOV phase: 100; section thickness, 2.0 mm with an intersection gap of 0,2 mm; flip angle: 25°; average: 2, distance factor: 20; bandwidth: 160 and phase end: R > > L.
In addition to MRI, spectroscopy was also performed at the Ondokuz Mayıs University hospital using a 1.5 T system (Magnetom Symphony, Siemens, Germany) wıth a six-channel head coil. Magnetic resonance spectroscopy (MRS) permits examination of the brain by detecting the levels of some metabolites related to neuronal and glial conditions . Also, MRS can explore aging at the molecular level. Multivoxel MRS was performed using a point-resolved spectroscopy sequence (CSI-Se-135-PRESS). The scanning parameters were Repetition Time/Echo Time (TR/TE): 1500/135 ms; average: 4; flip angle: 90°; water suppression BW: 35; FOV R > > L: 160; FOV A > > P: 160; thickness F > > H: 8 mm; Vol R > > L: 90; Vol A > > P: 60; width: 50; vector size: 1024; rotation: 3.00; preparation scans: 4; band width: 1000 and acquisition duration:1024. The total scan time was approximately 15 min. The raw data were evaluated automatically using a commercially available spectral analysis software package (Syngo Multi Modality Workplace version VE23A). Three dominant specific metabolites were analysed in this study, Cho at 3.21 ppm, Cr at 3.04 ppm and NAA at 2.02 ppm. 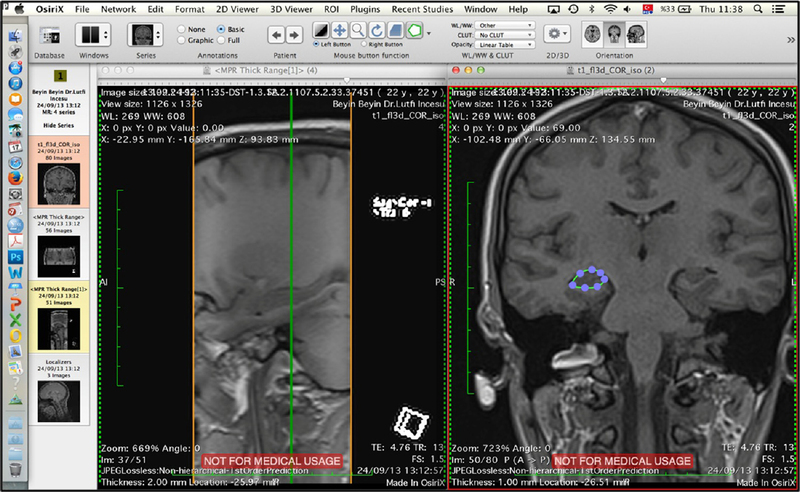 The original DICOM MR images obtained from the subjects were analysed on the software OsiriX 3.2.1 workstation to calculate the mean volume of the hippocampus [Figure 1]. Using the OsiriX software, the hippocampal boundary was manually traced three times in each slice, and the average area of the hippocampus was obtained. Using the 3D multiplanar reconstruction (MPR) option, the view size was enlarged to 768 × 768 mm, and 2 mm thick axial MPR images were generated in digital imaging and communications in medicine (DICOM) format. Figure 1: MR images from one subject showing the hippocampus. Images were analysed on the software OsiriX 3.2.1 workstation. Hippocampal volumes were estimated using the output data from this process. Neuropsychological tests were performed to determine the effects of EMF exposure on mental functions in each group. These were performed (Hanoi tower test, digit span test, K.A.S. test, stroop test, digit symbol test, Beck depression inventory test and Benton judgment of line orientation test) for each subject between 10:00 and 11:00 a.m. Informed consent was obtained from all subjects, and their planning skills were assessed using the classic tower of Hanoi. Performance in the tasks was assessed based on the time taken, number of moves required and how many times the rules were broken. Curve analysis of the operating properties of the receiver was performed to assess the usefulness of the tower of Hanoi in distinguishing the subjects in the two groups in terms of cognitive functions . This test assesses the parameters of attention and the stroop effect, which demonstrate the interference in the reaction time in a task. It involves the evaluation of selective attention, speed of processing, and flexibility of cognitive tasks, and is used for the assessment of executive functions. It is related to frontal lobe activity. The test consists of five sections and four cards. The parameters of time, number of fixed responses and number of errors are determined for each section. The stroop test is used to evaluate how easy a person can keep a goal in mind and choose an unfamiliar response by suppressing a habitual one. The test involves three sections. The first two parts consist of asking the subject to name the colours of 24 dots (colour naming) and 24 randomly coloured words in four columns (word naming). In the third section, subjects are asked to name the colours of words printed in colours that are deliberately not denoted by the name (for instance, the word “blue” may be written in red) (interference), and the time required to finish each task and colour word interference are evaluated . The digit symbol test task from the Wechsler Adult Intelligence Scale (WAIS) was applied to all subjects . The subjects were given coding keys matching nine numbers (1–9) to nine symbols. Under the coding key, lines of randomly arranged numbers were printed with empty boxes below. The subjects had 90 s in which to write as many numbers as possible in the empty boxes, taking into account the relations between digits and symbols given in the coding keys. The amount of successfully finished items gave the data for the assessment of the outcome . Relations between hippocampal morphology and memory were investigated using the digit span test . Attention and memory were assessed using the age-standardized score on the digit span test . Short-term memory was assessed using different modalities of stimulation and response like visual-oral (V-O), auroral (A-O), aural-written (V-W). Like other number sequence tests, this is used to evaluate attention . A commonly used parameter for testing depression levels is the Beck Depression Inventory test. This self-report test consists of 21 items scored on a 4-point scale between 0 (symptom not present) and 3 (very intense symptom). A shortened version of the test also exists, involving 7 items to be used by individuals providing primary care . Verbal fluency was assessed using the K.A.S. test . Subjects are required to verbally state as many words as they are able starting with a particular phoneme (K, A or S) in a specific category such as fruits, colours or animals. These letters were selected since they are the three most commonly used letters in Turkish. The subjects were given 1 min for each phoneme . The Benton judgment of line orientation test is a widely used neuropsychological test measuring visuospatial judgment. Responses given to 60 items contained in this test were manually recorded onto a database with a computerized basis. Both stimulus lines were required to be recognized to obtain a raw score of 1 for each item (total possible score = 60 points). In the event that only one or no stimulus line was successfully recognized, a raw score of 0 was awarded for that item ,. Statistical analysis were carried out on SPSS 21.0 software. 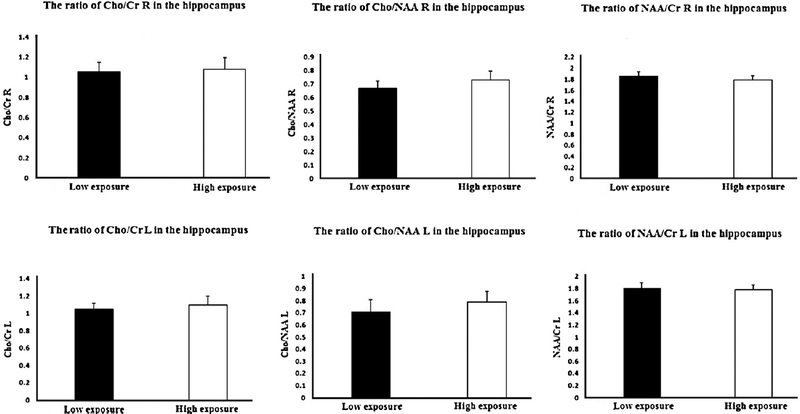 Relationships between groups in terms of hippocampal volumes and hippocampal ratios of related metabolites were evaluated using the Wilcoxon signed rank test. Cognitive analysis were performed with the Mann Whitney-U test and chi square test. Statistical significance was set at p < 0.05. Data were expressed as mean ± standard deviation (SD). In the present study; MRI belonging to hippocampus were investigated by stereological and spectroscopic analysis also neurophysiological tests in medical students that reported using mobile phones for <30 min daily use by the head and for >90 min daily use by the head. At this point; the findings obtained from these images were expressed as follows. Stereology now plays a central role and is an essential element in morphometric studies ,. 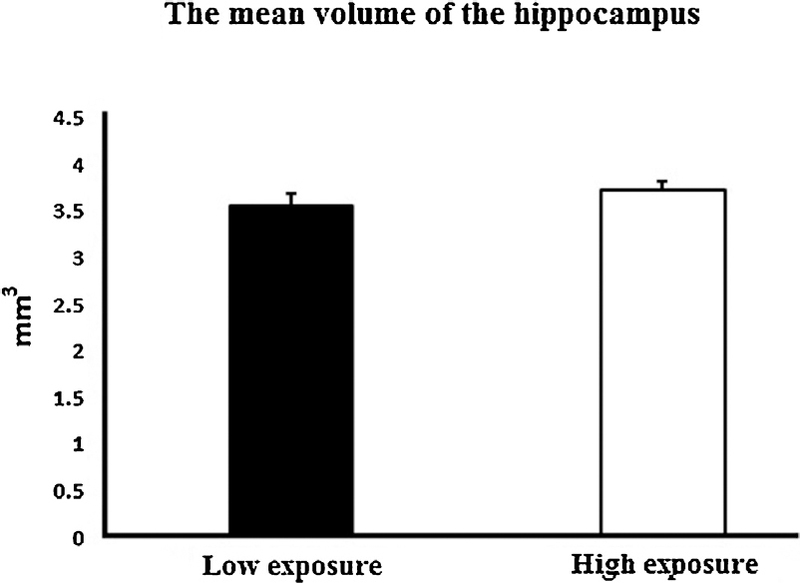 At this point, according to our stereological results there was no significant difference in the volume of hippocampus between the low and high exposere groups (p > 0.05) [Figure 2]. In addition, the mean coefficient of variation (CV) values for two groups were displayed as follows [Table 1]. Figure 2: Graph showing hippocampal volumes in the two groups; no significant difference was observed between the groups (p □ 0.05). Table 1: Mean CV values of hippocampus volumes for each group; CV, coefficient of variation. In the present study, EMF exposure-dependent alterations in the cerebral metabolites were analysed using MRS. At this point, there was no significant difference between the groups in terms of spectroscopic analysis (p > 0.05) [Figure 3]. Figure 3: This graph shows the ratios of particular metabolites in the right (R) and left (L) hemispheres of the brain. Groups A, B and C indicate the ratios of ChoCr, ChoNAA and NAACr in the right hemisphere, while group D, E and F indicate the ratios of ChoCr, ChoNAA and NAACr in the left hemisphere. There was no significant difference between the groups (p □ 0.05). Cho, cholin; NAA, N-acetylaspartate; Cr, creatine. Analysis of the applied neuropsychiatric tests revealed no significant differences in terms of perceptual process, structuring, mental functions or frontal executive function tests. Cognitive test results revealed a significant difference between the groups only in the stroop, and digit span (backward) tests performed to evaluate attention (p < 0.05). Furthermore, there were no significant differences between the groups in terms of the applied K.A.S. test (p > 0.05). 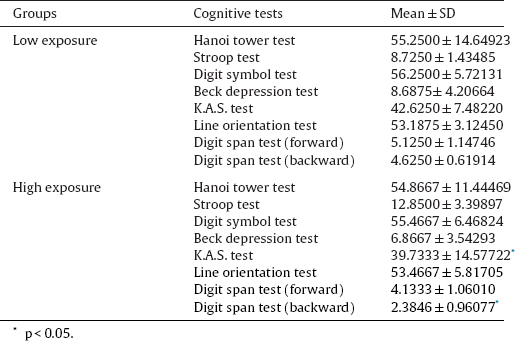 All mean ± SD values belonging to cognitive tests were displayed as follows [Table 2]. Table 2: Mean ± SD values belonging to cognitive tests for each group. Many animal and human studies have focused on biological effects of EMF exposure, and particularly on changes in blood brain barrier permeability, neuronal structure and function and memory function ,,. Some animal studies have reported no effect of EMF on neuronal structure, memory function or blood-brain permeability ,. Generally, experimental and epidemiological studies belonging to animals which show the side-effects of EMF have investigated these at frequencies of 900 and 1800 MHz, due to the widespread use of mobile phones ,. Previous experimental studies of animals have reported adverse effects of mobile phone exposures on the development of the central nervous system during gestation ,,. Similarly, previous studies using a mouse model have suggested that RF-EMF exposure leads to harmful effects on memory tasks and neurobehavioral functions ,,. However, many studies which used a rat model have also reported that RF-EMF exposure has no effects on spatial learning and memory tasks ,,. Furthermore, some studies which used rats as a model have even reported that RF-EMF exhibits beneficial effects on cognitive functions ,,. In addition to animal studies, alterations in visual cerebral potentials have also been reported in humans . Furthermore, Jalaluddin et al. investigated the normalised volume of the hippocampus in normal Malay children and adolescents. At this point, they demonstrated that there was no significant difference between the actual and normalised values of hippocampal volume in their study . Moreover, Volkow et al. indicated that RF-EMF exposure from cell phone use affects function of brain in humans, as shown by the regional increases in metabolic activity . Additionally, Aalto et al. demonstrated that EMF emitted by a mobile phone affects regional cerebral blood flow in humans . Besides, Haarala et al. reported that 902 MHz EMF emitted by mobile phones had no effect on the cognitive functioning in humans . Furthermore, Verrender et al. displayed that 920 MHz EMF exposure may affect the cognitive performance of humans . However, inconsistent evidence exists about the effects of RF-EMF on cognitive functions and associations with hippocampal functions ,,. At this point, further investigation of the mechanisms underlying the impacts of mobile phones on the brain is needed. In the present study, we examined MR images obtained from medical students humans using stereological methods. We estimated hippocampal volumes using OsiriX 3.2.1 software in humans who used the mobile phone for <30 min daily use by the head and for >90 min daily use by the head. However, no significant difference was determined between the groups in terms of hippocampal volumes. In this context, there have been very few studies to date investigating the effects of mobile phones on hippocampal volume in the human brain using MR images. Wang et al. investigated volumetric changes in grey and white matter associated with mobile phone use by investigating functional magnetic resonance images (fMRI) in college students. They suggested that overuse of mobile phones can cause alterations in cerebral morphology and that these alterations may help to understand the effects of EMF on the brain and underlying neuronal mechanisms . In this study, we performed spectroscopic and neurocognitive tests to evaluate correlations with volumetric values. Our findings showed a significant difference between the groups in the stroop and digit span (backward) tests, involving the assessment of attention. Our study may be crucially important to understanding lack of attention and concentration. Additionally, we also observed a decreased ability to suppress stimuli in subjects who talk on the mobile phone for extended periods. However, we determined no significant difference in other neurological tasks between the groups. Schoeni et al. investigated the effects of nocturnal mobile phone use on cognitive functions in adolescents, employing neurocognitive tests to measure verbal and figural memory. They suggested that nocturnal use of mobile phones may lead to an increase in health symptoms such as rapid fatigue and headache. However, and in contrast to our results, they observed no effect of exposure to EMF emitted by mobile phones on concentration capacity and memory . In addition to these effects of mobile phones on cognitive performance, Movvahedi et al. studied the short-term effects of RF radiation on reaction time and short-term memory in elementary school students. Those authors suggested that electromagnetic radiation exhibited beneficial effects on short-term memory . We also investigated metabolic changes in the brain, using the spectroscopic analysis in addition to volumetric and cognitive tests. The metabolites were identified in the brain in terms of energy metabolism and cognitive functions. Cho, Cr and NAA are particularly associated with membrane metabolism, and Cho is the metabolite responsible for producing phosphocholine for membrane synthesis in all cells . In the present study we observed no significant difference between the groups in terms of ratios of Cho/Cr, Cho/NAA or NAA/Cr in the right and left hemispheres. When the literatures were searched, it can be seen that there are various studies on the different exposure conditions. At this point, Legros et al. reported that 60 Hz magnetic field exposure at 1800 μT can modulate activity in specific brain regions after the end of the exposure period which was 1 h . Furthermore, Mortazavi et al. showed that the university students were significantly affected by a 10 min exposure to EMF in a day emitted by mobile phone . On the contrary, Movvahedi et al. indicated that a 10 min talk period in a day could not alter the reaction time and short-term memory in the elementary school students who are between 8 and 10 years of age . In the conclusion, in our small study the use of mobile phones for more than 90 min in a day is associated with increased problems of concentration and attention. However, prolonged use of mobile phones in our study found no impact on memory tasks and hippocampal volume. Further research involving larger numbers of subjects is now needed in order to validate these findings and in order to determine if there are very small changes in hippocampal volume in exposed individuals compared to controls. The protocol of this study was approved by the Human Ethics Committee of Ondokuz Mayıs University (2014/547). The experimental part of this study was performed at the Ondokuz Mayıs University Departments of Neurology and Radiology. Volume estimation was done at the Ondokuz Mayıs University Department of Histology and Embryology, Samsun, Turkey. Preparation of the draft and revision of the manuscript have been done in the Departments of Neurology and Radiology, Histology and Embryology and The Hebrew University Medical School, and Environmental Health Trust, Teton Village, Wyoming, USA. This study was supported by Ondokuz Mayıs University, project management office (PYO.TIP. 1901.13.020). Roser K, Schoeni A, Röösli M. Mobile phone use, behavioural problems and concentration capacity in adolescents: a prospective study. Int J Hyg Environ Health 2016;219:759-69. Ahlbom A, Green A, Kheifets L, Savitz D, Swerdlow A. Epidemiology of health effects of radiofrequency exposure. Environ Health Perspect 2004;112:1741-54. Mausset AL, de Seze R, Montpeyroux F, Privat A. Effects of radiofrequency exposure on the GABAergic system in the rat cerebellum: clues from semiquantitative immunohistochemistry. Brain Res 2001;912:33-46. Odaci E, Bas O, Kaplan S. Effects of prenatal exposure to a 900 megahertz electromagnetic field on the dentate gyrus of rats: a stereological and histopathological study. Brain Res 2008;1238:224-9. Gultekin DH, Moeller L. NMR imaging of cell phone radiation absorption in brain tissue. Proc Natl Acad Sci U S A 2013;110:58-63. Hardell L, Carlberg M, Soderqvist F, Hansson Mild K. Meta-analysis of long-term mobile phone use and the association with brain tumours. Int J Oncol 2008;32:1097-103. Hosseini-Sharifabad M, Esfandiari E, Hosseini-Sharifabad A. The effect of prenatal exposure to restraint stress on hippocampal granule neurons of adult rat offspring. Iran J Basic Med Sci 2012;15:1060-7. Baş O, Sönmez OF, Aslan A, İkinci A, Hancı H, Yıldırım M, et al. Pyramidal cell loss in the cornu ammonis of 32-day-old female rats following exposure to a 900 megahertz electromagnetic field during prenatal days 13-21. NeuroQuantology 2013;11:591-9. Salford LG, Brun AE, Eberhardt JL, Malmgren L, Persson BR. Nerve cell damage in mammalian brain after exposure to microwaves from GSM mobile phones. Environ Health Perspect 2003;111:881-3. Hossmann KA, Hermann DM. Effects of electromagnetic radiation of mobile phones on the central nervous system. Bioelectromagnetics 2003;24:49-62. Adey WR. Tissue interactions with non-ionising electromagnetic fields. Physiol Rev 1981;61:435-514,1981. D’Andrea JA, Chou CK, Johnston SA, Adair ER. Microwave effects on the nervous system. Bioelectromagnetics 2003;l6:107-47. Masuda H, Hirota S, Ushiyama A, Hirata A, Arima T, Kawai H, et al. No dynamic changes in blood-brain barrier permeability occur in developing rats during local cortex exposure to microwaves. In Vivo 2015;29:351-7. Cardis E, Armstrong BK, Bowman JD, Giles GG, Hours M, Krewski D, et al. Risk of brain tumours in relation to estimated RF dose from mobile phones: results from five interphone countries. Occup Environ Med 2011;68:631-40. Cardis E, Varsier N, Bowman JD, Deltour I, Figuerola J, Mann S, et al. Estimation of RF energy absorbed in the brain from mobile phones in the interphone study. Occup Environ Med 2011;68:686 93. Benson VS, Pirie K, Schüz J, Reeves GK, Beral V, Green J, et al. Mobile phone use and risk of brain neoplasms and other cancers: prospective study. Int J Epidemiol 2013;42:792-802. Hardell L, Carlberg M, Soderqvist F, Mild KH. Case-control study of the association between malignant brain tumours diagnosed between 2007 and 2009 and mobile and cordless phone use. Int J Oncol 2013;43:1833-45. Coureau G, Bouvier G, Lebailly P, Fabbro-Peray P, Gruber A, Leffondre K, et al. Mobile phone use and brain tumours in the CERENAT case-control study. Occup Environ Med 2014;71:514-22. Hardell L, Carlberg M. Mobile phone and cordless phone use and the risk for glioma analysis of pooled case-control studies in Sweden, 1997-2003 and 2007-2009. Pathophysiology 2015;22:1-13. Lazzaro V, Capone F, Apollonio F, Borea PA, Cadossi R, Fassina L, et al. A consensus panel review of central nervous system effects of the exposure to low-intensity extremely low-frequency magnetic fields. Brain Stimul 2013;6:469-76. Altunkaynak BZ, Altun G, Yahyazadeh A, Kaplan AA, Deniz OG, Türkmen AP, et al. Different methods for evaluating the effects of microwave radiation exposure on the nervous system. J Chem Neuroanat 2016;75:62-9. Khiat A, Boulanger Y, Breton G. Monitoring the effects of mobile phone use on the brain by proton magnetic resonance spectroscopy. Int J Radiat Biol 2006;82:681-5. Balachandar R, Tripathi R, Bharath S, Kumar K. Classic tower of hanoi, planning skills, and the Indian elderly. East Asian Arch Psychiatry 2015;25:108-14. Masiliūnas R, Vitkutė D, Stankevičius E, Matijošaitis V, Petrikonis K. Response inhibition set shifting and complex executive function in patients with chronic lower back pain. Medicina 2017;53:26-33. Wechsler D. WISC-III: Wechsler intelligence scale for children. 3rd ed. San Antonio, TX: Psychological corporation; 2017. MacDonald SW, Hultsch DF, Strauss E, Dixon RA. Age-related slowing of digit symbol substitution revisited: what do longitudinal age changes reflect. J Gerontol B Psychol Sci Soc Sci 2003;58:187-94. Valdés Hernández MD, Cox SR, Kim J, Royle NA, Muñoz Maniega S, Gow AJ, et al. Hippocampal morphology and cognitive functions in community-dwelling older people: the Lothian Birth Cohort 1936. Neurobiol Aging 2016;52:1-11. Gencpinar P, Kalay Z, Turgut S, Bozkurt O, Duman O, Ozel D, et al. Evaluation of executive functions in patients with childhood absence epilepsy. J Child Neurol 2016;31:824-30. Beck AT, Steer RA. Internal consistencies of the original and revised Beck Depression Inventory. J Clin Psychol 1984;40:1365-7. Johansson G, Risberg J, Rosenhall U, Orndahl G, Svennerholm L, Nyström S. Cerebral dysfunction in fibromyalgia: evidence from regional cerebral blood flow mesurements, otoneurological tests and cerebrospinal fluid analysis. Acta Psychiat Scand 1995;91:86-94. Benton AL, Varney N, Hamsher K. Visuospatial judgment: a clinical test. Arch Neurol 1978;35:364-7. Calamia M, Markon K, Denburg NL, Tranel D. Developing a short form of Benton’s judgment of line orientation test: an item response theory approach. Clin Neuropsychol 2011;25:670-84. Schmitz C, Hofc PR. Design-based stereology in neuroscience. J Neurosci 2005;130:813-31. Altunkaynak BZ, Önger ME, Altunkaynak ME, Ayranci E, Canan S. A brief introduction to stereology and sampling strategies: basic concepts of stereology. Neuroquantology 2012;10:31-43. Salford LG, Brun A, Sturesson K, Eberhardt JL, Persson JR. Permeability of the blood-brain barrier induced by 915 MHz electromagnetic radiation, continuous wave and modulated at 8, 16, 50, and 200 Hz. Microsc Res Tech 1994;27:535-42. Lai H, Horita A, Guy AW. Microwave irradiation affects radial-arm maze performance in the rat. Bioelectromagnetics 1994;15:95-104. Tsurita G, Nagawa H, Ueno S, Watanabe S, Taki M. Biological and morphological effects on the brain after exposure of rats to a 1439 MHz TDMA field. Bioelectromagnetics 2000;21:364-71. Cosquer B, Kuster N, Cassel JC. Whole-body exposure to 2.45 GHz electromagnetic fields does not alter 12-arm radial-maze with reduced access to spatial cues in rats. Behav Brain Res 2005;161:331-4. Koyu A, Cesur G, Ozguner F, Akdogan M, Mollaoglu H, Ozen S. Effects of 900 MHz electromagnetic field on TSH and thyroid hormones in rats. Toxicol Lett 2005;157:257-62. Panagopoulos DJ, Chavdoula ED, Nezis IP, Margaritis LH. Cell death induced by GSM 900 MHz and DCS 1800 MHz mobile telephony radiation. Mutat Res 2007;626:69-78. Odaci E, Kaplan S, Sahin B, Bas O, Gevrek F, Aygun D, et al. Effects of low-dose oxcarbazepine administration on developing cerebellum in newborn rat: a stereological study. Neurosci Res Commun 2004;34:28-36. Ntzouni MP, Stamatakis A, Stylianopoulou F, Margaritis LH. Short term memory in mice is affected by mobile phone radiation. Pathophysiology 2011;18:193-9. Aldad TS, Gan G, Gao XB, Taylor HS. Fetal radiofrequency radiation exposure from 800 to 1900 MHz rated cellular telephones affects neurodevelopment and behavior in mice. Sci Rep 2012;2:312. Ntzouni MP, Skouroliakou A, Kostomitsopoulos N, Margaritis LH. Transient and cumulative memory impairments induced by GSM 1.8 GHz cell phone signal in a mouse model. Electromagn Biol Med 2013;32:95-120. Sienkiewicz ZJ, Blackwell RP, Haylock RG, Saunders RD, Cobb BL. Low-level exposure to pulsed 900 MHz microwave radiation does not cause deficits in the performance of a spatial learning task in mice. Bioelectromagnetics 2000;21:151-8. Dubreuil D, Jay T, Edeline JM. Head-only exposure to GSM 900 MHz electromagnetic fields does not alter rat’s memory in spatial and non-spatial tasks. Behav Brain Res 2003;145:51-61. Maaroufi K, Had-Aissouni L, Melon C, Sakly M, Abdelmelek H, Poucet B, et al. Spatial learning, monoamines and oxidative stress in rats exposed to 900 MHz electromagnetic field in combination with iron overload. Behav Brain Res 2014;258:80-9. Dragicevic N, Bradshaw PC, Mamcarz M, Lin X, Wang L, Cao C, et al. Long-term electromagnetic field treatment enhances brain mitochondrial function of both Alzheimer’s transgenic mice and normal mice: a mechanism for electromagnetic field-induced cognitive benefit. Neuroscience 2011;185:135-49. Arendash GW, Mori T, Dorsey M, Gonzalez R, Tajiri N, Borlongan C. Electromagnetic treatment to old Alzheimer’s mice reverses beta-amyloid deposition, modifies cerebral blood flow, and provides selected cognitive benefit. PLoS One 2012;7:35751. Banaceur S, Banasr S, Sakly M, Abdelmelek H. Whole body exposure to 2.4 GHz WIFI signals: effects on cognitive impairment in adult triple transgenic mouse models of Alzheimer’s disease (3xTg-AD). Behav Brain Res 2013;240:197-201. Freude G, Ullsperger P, Eggert S, Ruppe I. Effects of microwaves emitted by cellular phones on human slow brain potentials. Bioelectromagnetics 1998;19:384-7. Jalaluddin WM, Mat Jusoh N, Ali Basahai IA, Abdullah MS, Abdul Karim AH, Gazali AK. Normalised MRI volumetry of the hippocampus among normal Malay children and adolescents. Malays J Med Sci 2013;20:31-8. Volkow ND, Tomasi D, Wang GJ, Vaska P, Fowler JS, Telang F, et al. Effects of cell phone radiofrequency signal exposure on brain glucose metabolism. JAMA 2011;305:808-13. Aalto S, Haarala C, Brück A, Sipilä H, Hämäläinen H, Rinne JO. Mobile phone affects cerebral blood flow in humans. J Cereb Blood Flow Metab 2006;26:885-90. Haarala C, Bjornberg L, Ek M, Laine M, Revonsuo A, Koivisto M, et al. Effect of a 902 MHz electromagnetic field emitted by mobile phones on human cognitive function: a replication study. Bioelectromagnetics 2003;24:283-8. Verrender A, Loughran SP, Dalecki A, McKenzie R, Croft RJ. Pulse modulated radiofrequency exposure influences cognitive performance. Int J Radiat Biol 2016;92:603-10. Koivisto M, Krause CM, Revonsuo A, Laine M, Hamalainen H. The effects of electromagnetic field emitted by GSM phones on working memory. Neuroreport 2000;11:1641-3. Krause CM, Haarala C, Sillanmaki L, Koivisto M, Alanko K, Revonsuo A, et al. Effects of electromagnetic field emitted by cellular phones on the EEG during an auditory memory task: a double blind replication study. Bioelectromagnetics 2004;25:33-40. Wang Y, Zou Z, Song H, Xu X, Wang H, d’Oleire Uquillas F, et al. Altered gray matter volume and white matter integrity in college students with mobile phone dependence. Front Psychol 2016;7:597. Schoeni A, Roser K, Röösli M. Symptoms and cognitive functions in adolescents in relation to mobile phone use during night. PLoS One 2015;10:0133528. Movvahedi MM, Tavakkoli-Golpayegani A, Mortazavi SA, Haghani M, Razi Z, Shojaie-Fard MB, et al. Does exposure to GSM 900 MHz mobile phone radiation affect short-term memory of elementary school students. J Pediatr Neurosci 2014;9:121-4. Dokumacı DŞ, Doğan F, Yıldırım A, Boyacı FN, Bozdoğan E, Koca B. Brain metabolite alterations in Eisenmenger syndrome: evaluation with MR proton spectroscopy. Eur J Radiol 2017;86:70-5. Legros A, Modolo J, Brown S, Roberston J, Thomas AW. Effects of a 60 Hz magnetic field exposure up to 3000 µT on human brain activation as measured by functional magnetic resonance imaging. PLoS One 2015;10:e0132024. Mortazavi SM, Atefi M, Kholghi F. The pattern of mobile phone use and prevalence of self-reported symptoms in elementary and junior high school students in Shiraz, Iran. Iran J Med Sci 2011;36:96-103. 1 Are rises in Electro-Magnetic Field in the human environment, interacting with multiple environmental pollutions, the tripping point for increases in neurological deaths in the Western World?